Spend the night with your Girl Scout troop as part of our annual Girls Exploring Math and Science event! You’ll participate in a Museum-wide scavenger hunt, travel to the stars and beyond with a show in our world-class Burke Baker Planetarium, and settle down to sleep in a Museum exhibit. Be the first ones to attend the GEMS event in the morning. Visit Community and Student STEM Ambassador booths to learn more about careers and projects in science, technology, engineering, and math. The GEMS overnight is exclusively for Girl Scouts and their leaders. 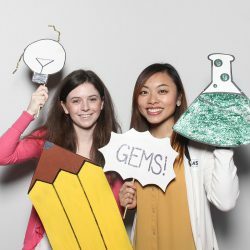 To be added to our email notification list to receive the most up-to-date information about the GEMS Overnight program, please email overnights@hmns.org. Additional information about the GEMS Overnight will be available later this fall. Registration will open in November.